We may see in front of us the consequences of the so-called "momentum". And we may see it enough to determine how it consists: confidence. John McCain lost his confidence few weeks ago. He is not convincing because, and perhaps only because, he doesn't seem to be convinced anymore. While Barack Obama staid focus, stuck to his lines, went on his campaign, without paying attention to the ups and downs of the polls, the Biden's blunders, nor the republican attacks, ending up making an impression of a ground swell moving on; John McCain seems to have tried to use a momentum to improve his campaign, surfing on the waves, going up, shooting from the hips, playing the maverick card when the polls backed him, and following them down with the financial meltdown. He now appears to be swept away. Hesitant, confused, doubtful. His campaign had so much skill to take every opportunity, whatever their hypocrisy or their lies, from the forum of the faith, then the RNC Convention or the pick of Sarah Palin, to their arrogance in redefining the meaning of change to make it fit to McCain, which almost succeeded until the financial crisis. The last smart move was McCain's suspending his campaign. Too bad for him, he suspended his suspending. David Letterman's making fun at his hesitations announced the end. The McCain strategy turns out now to reveal all its flaws. McCain struggles hard to try to get back this momentum, this confidence, he needs to go on, but the opportunities become rare and the margins narrow. His last attempts sound desperate as his critical tone against George Bush to try to distance himself from him or his Joe the plumber gimmick, his repeating over and over Obama will increase taxes or also his playing the scaremonger card, throwing terrorism, race, confusion or anything in the garbage at Obama (check this page out to count how many McCain's ads are positives). Today, on "Meet the Press" he seemed tired, unable to make a point anymore, struck. Does he think everything is lost yet? That's however how it felt. Why can't McCain get back his coolness, his sense of humor, his straight to the point way of talking? Why didn't he stick to his line while his campaign suspension to make it believable? Why didn't he distance himself from George Bush way before, letting Sarah Palin talking to the republican base, which was the only thing she was useful to? Why all his qualities appear to be flaws? The McCain campaign chose a short-run moves strategy, perfect to make a momentum up, but they turn out to be too short, while Barack Obama made a campaign on a long run, no fuss, no moves, which proves to be solid and reliable. Are the McCain campaign advisers going to be able to throw one of those clever trick they are good at during the week before us? Colin Powell strongly and solemnly endorsed Barack Obama today on "Meet the press". He went over the main points of this campaign: he deplored the negative tone of the McCain campaign, the lack of judgement in the pick of Sarah Palin, the confusion of McCain about economy and the republican party's sliding toward the right, which makes McCain become "narrower and narrower", while Barack Obama leads an "inclusive campaign". According to Colin Powell, Obama displays "a steadiness, an intellectual curiosity" and "a depth of knowledge" in his approach. This grave endorsement must have sent shivers down McCain Campaign's spine. But would it be enough for them to stop playing around? Did John McCain screw up by saying he screwed up? We underlined how McCain's hesitations to suspend his campaign were a turning point after what he lost his credibility. His canceling his appearance on the Late show was the worst idea his campaign had, since they gave the opportunity for David Letterman to make fun at him by pointing he stayed in New York... McCain had obviously to move on... But I wonder how many people work in his campaign? And how many hours did they waiste to build different strategies, to find out some excuses, to devise some unbelievable stories and to end up making up this move: go back on the Late show, make no explanation, no excuse, just say: "I screwed up" and hope it will work? Both candidates John McCain and Barack Obama happen to be normal and casual people at this Alfred E. Smith Memorial Foundation Dinner... They both have to be polite and hypocrite, doing boring things while pretending to have fun... They might have even enjoyed this dinner , being flattered by so many "distinguished", "influential" and conceited persons' surrounding them. But the third and last debate between Barack Obama and John McCain happened yesterday. 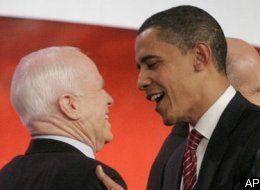 The confidence of Obama was strong enough to make fun of every McCain's smart or tough move, for whom everything appears to be too late and doesn't worth the trouble anymore. For those who didn't get what was this "Joe the plumber" gimmick during the debate, here is a video of Joe Wurzelbacher raising a question to Barack Obama who muddles through this by taking a rare long time to answer and explaining really brightly all the advantages of his tax plan, even for Joe who will pay more taxes but "would" have pay less during the last 25 years... Is this conditional and hypothetical past cut convincing enough? More seriously, since no one was expecting anything of Sarah Palin, after the National Review's article or the SNL's sketches, but her to wipe the floor, she did, of course, a really good job. I was impressed by her memory's ability and her reading so fast the notes she was probably helped to write. Joe Biden hadn't such a margin: he avoided to attack her, which would have been perilous, because she's a woman and also because this lack of experience issue could have been used by Palin to backfire on Obama. He chose to focus on attacking McCain, which was the more sure target he had. He probably did the most he could do. Poll shows John McCain is weakened while Barack Obama significantly leads. In times of crisis, people usually turn to the republican, who are supposed to be more reassuring, as we saw the Bush campaign using 9-11 against John Kerry. John McCain is known, and makes him known, as someone who shoots from the hips, while Barack Obama is considered to be an intellectual. We remember on the faith forum how Obama's considering every single aspects of a matter before answering to a question works against his own interests and how the straight to the point answers of McCain succeeded to convince. But it appears in this financial crisis that what was a quality tuns out to be a flaw and vice-versa. The McCain's shooting from the hips habit makes hims look fluster and incoherent while Obama's calm and controlled mind sounds trustworthy. Even though economy is a really unfavorable subject for the republican, the McCain's strategy was really bad managed and his suspending his camapaign sounded more like a desperate move than a tough decision since he was not able to stick to his line. McCain's strategy seems to use short-run moves to create a momentum. The impact of his Sarah Palin's pick is now lowering, and even backfiring on him. He needs a fresh smoke screen to stay tuned in the race. A surprised, amused and critical look on the U.S. elections. Get the (trigger) happy - claude p�s widget and many other great free widgets at Widgetbox!